Complex changes in GABAA receptors (GABAARs) in animal models of temporal lobe epilepsy during the chronic period include a decrease in the δ subunit and increases in the α4 and γ2 subunits in the dentate gyrus. We used postembedding immunogold labeling to determine whether the subcellular locations of these subunits were also altered in pilocarpine-treated epileptic mice, and related functional changes were identified electrophysiologically. The ultrastructural studies confirmed a decrease in δ subunit labeling at perisynaptic locations in the molecular layer of the dentate gyrus where these subunits are critical for tonic inhibition. Unexpectedly, tonic inhibition in dentate granule cells was maintained in the epileptic mice, suggesting compensation by other GABAARs. An insensitivity of the tonic current to the neurosteroid tetrahydrodeoxy-corticosterone was consistent with decreased expression of the δ subunit. In the pilocarpine-treated mice, α4 subunit labeling remained at perisynaptic locations, but increased γ2 subunit labeling was also found at many perisynaptic locations on granule cell dendrites, consistent with a shift of the γ2 subunit from synaptic to perisynaptic locations and potential partnership of the α4 and γ2 subunits in the epileptic animals. The decreased γ2 labeling near the center of synaptic contacts was paralleled by a corresponding decrease in the dendritic phasic inhibition of granule cells in the pilocarpine-treated mice. These GABAAR subunit changes appear to impair both tonic and phasic inhibition, particularly at granule cell dendrites, and could reduce the adaptive responses of the GABA system in temporal lobe epilepsy. Numerous changes in GABAA receptor (GABAAR) subunits occur in animal models and humans with temporal lobe epilepsy (TLE) (Rice et al., 1996; Schwarzer et al., 1997; Brooks-Kayal et al., 1998; Fritschy et al., 1999; Loup et al., 2000; Houser and Esclapez, 2003; Peng et al., 2004). These changes are complex and include both increased and decreased expression of several GABAAR subunits. The functional consequences of these changes are likely to depend not only on the specific subunits that are altered but also on the cell types and cellular domains (e.g., soma and dendrites) in which the alterations occur; the location of the subunits at synaptic, perisynaptic, or extrasynaptic sites; and the resulting subunit composition of the modified receptors. A consistent pattern of GABAAR subunit changes that has been identified in several TLE models includes decreased expression of the δ subunit along with increased expression of γ2 and α4 subunits in the dentate gyrus (Schwarzer et al., 1997; Peng et al., 2004; Nishimura et al., 2005). Interestingly, changes in these subunits could alter both tonic and phasic inhibition in the dentate gyrus. Normally, in the forebrain, the δ and α4 subunits are preferential partners in many GABAARs that mediate tonic inhibition (Sur et al., 1999; Jia et al., 2005) and are located primarily at perisynaptic and extrasynaptic sites (Nusser et al., 1998b; Wei et al., 2003; Sun et al., 2004; Liang et al., 2006). In contrast, the γ2 subunit plays a major role in phasic inhibition (Nusser and Mody, 2002) and is located directly at many GABAergic synapses, as well as some extrasynaptic sites (Somogyi et al., 1996; Nusser et al., 1998b; Sassoè-Pognetto et al., 2000). Several functional consequences are suggested by the altered expression of these particular GABAAR subunits. First, the decreases in δ subunit expression could lead to a decrease in tonic inhibition and an associated increase in excitability in the region (for review, see Semyanov et al., 2004). However, increases in γ2 subunit expression could contribute to increased phasic (synaptic) inhibition, possibly as a compensatory response. The potential effects of increased α4 subunit expression are unclear but should depend on the subcellular localization of this subunit in the epileptic animals. If the α4 subunit were to remain in its normal perisynaptic location, it could contribute to maintained tonic inhibition, possibly in combination with some other subunit(s). Alternatively, if α4 subunit expression were to increase directly at the synapse, it could contribute to phasic inhibition. The goals of this study were to determine the subcellular locations of the δ, α4, and γ2 subunits on the dendrites of granule cells in a mouse pilocarpine model of TLE and identify potentially related alterations in tonic and phasic inhibitions in dentate granule cells. Our findings indicate that the decrease in δ subunit expression is associated with altered subcellular localization of the γ2 subunit and accompanying modifications of both tonic and phasic inhibitions of dentate granule cells. A preliminary report of some findings has been published previously in abstract form (Zhang et al., 2003). Young adult male C57BL/6 mice, 30–60 d of age (Harlan, Indianapolis, IN), were used in the present studies. All animal use protocols conformed to National Institutes of Health guidelines and were approved by the University of California, Los Angeles, Chancellor's Animal Research Committee. Sustained seizures were induced by administration of pilocarpine, as described previously (Peng et al., 2004). Briefly, mice were pretreated with a low dose of the cholinergic antagonist methylscopolamine nitrate (1 mg/kg, i.p. ; Sigma-Aldrich, St. Louis, MO) to reduce peripheral cholinergic effects. Experimental mice received an injection of pilocarpine hydrochloride (340 mg/kg, i.p. ; Sigma-Aldrich) 30 min later to induce status epilepticus (SE). Seizures were monitored and terminated with diazepam (DZ) (7 mg/kg, i.p. ; Abbott Laboratories, Chicago, IL) 2 h after the onset of SE. Control mice received the same series of injections as experimental mice except for an injection of saline in place of pilocarpine. After recovering from SE, pilocarpine-treated mice were videotaped to monitor the occurrence of spontaneous seizures. All animals were studied during the chronic period, 2–6 weeks after pilocarpine treatment, and spontaneous seizures had been observed in all animals. Ten pairs of experimental and control mice were used for electron microscopy, and an additional eight pairs of experimental and control mice were used for electrophysiological studies. Two α5 subunit-deficient mice (Glykys and Mody, 2006) were also included in the electrophysiological analyses. Subunit-specific polyclonal antisera that recognize δ, γ2, or α4 subunits of GABAARs were used in this study. Antisera against δ and γ2 subunits were produced in rabbits to the following synthetic N-terminal peptide sequences: δ (1–44) (Sperk et al., 1997) and γ2 (319–366) (Tretter et al., 1997). The specificities of the affinity-purified antisera have been demonstrated previously in immunochemical (Jechlinger et al., 1998) and immunohistochemical (Sperk et al., 1997; Peng et al., 2002) studies. These two antisera were kindly provided by Dr. Werner Sieghart (Medical University of Vienna, Vienna, Austria). Another γ2 antiserum that was used in this study was raised in guinea pigs to a synthetic rat N-terminal peptide sequence γ2(1–29) and has been characterized previously (Fritschy and Mohler, 1995). This antiserum was kindly provided by Dr. Jean-Marc Fritschy (University of Zurich, Zurich, Switzerland). A rabbit antiserum against the α4 subunit (N terminus) was purchased from Chemicon (AB5457; Chemicon, Temecula, CA), and the specificity of this antiserum has been demonstrated recently in ultrastructural studies of rats (Liang et al., 2006). No specific immunolabeling was observed in either δ or α4 subunit-deficient mice when antiserum to either δ or α4 subunits was used, respectively, and this further supports the specificity of these antisera (Peng et al., 2002; Chandra et al., 2006). The two γ2 antisera raised in rabbit and guinea pig produced similar ultrastructural labeling. The specificity of the rabbit γ2 subunit antiserum for postembedding immunogold labeling has been established by Somogyi et al. (1996), and this antiserum displays no cross-reactivity with either γ1 or γ3 subunits. Tissue preparation for electron microscopy. Mice were deeply anesthetized with sodium pentobarbital (90 mg/kg, i.p.) at 2 or 4 weeks after pilocarpine-induced SE and perfused through the ascending aorta with a fixative solution of 4% paraformaldehyde and 0.1% glutaraldehyde in 0.12 m phosphate buffer, pH 7.3. The brains were kept in situ at 4°C for 2 h, removed from the skull, postfixed for an additional 2 h in the same fixative as that used for perfusion, and then rinsed thoroughly in buffer. Forebrain tissue was sectioned coronally at 0.5–1 mm with a razor blade, and small blocks of tissue that contained the molecular and granule cell layers were trimmed from the upper blade of the dentate gyrus. These specimens were immersed in 5% sucrose and then in 10, 20, and 30% glycerol in 0.12 m phosphate buffer, pH 7.3, for 2 h each. Methods for freeze substitution and low-temperature embedding have been described previously (Wei et al., 2003; Liang et al., 2006). Briefly, cryoprotected sections were rapidly plunged into liquid propane cooled by liquid nitrogen to −190°C in a cryofixation unit (EM CPC; Leica, Wien, Austria). Tissues were then transferred to a cryosubstitution unit (EM AFS, Leica) that was programmed for all subsequent steps. Specimens were immersed in 4% uranyl acetate (Electron Microscopy Sciences, Fort Washington, PA) dissolved in anhydrous methanol for 24 h at −90°C, and the temperature was then raised to −45°C by steps of 5°C and held for an additional 24 h at −45°C. Specimens were rinsed in methanol and infiltrated with Lowicryl HM20 resin (Electron Microscopy Sciences) for 48 h at −45°C. The resin was polymerized with ultraviolet light (360 nm) for 24 h at −45°C, and the temperature was then increased progressively by steps of 4°C until it reached 0°C and was maintained at this temperature for an additional 20–24 h.
Ultrathin sections were cut on a microtome (Reichert-Jung, Vienna, Austria), picked up on nickel mesh grids that were freshly coated with a Coat-Quick “G” pen (Electron Microscopy Sciences), and air-dried at room temperature. The tissue was processed with slight modifications of the immunogold labeling methods of Matsubara et al. (1996), and the current methods have been used previously for GABAAR subunit localization (Wei et al., 2003; Liang et al., 2006). Briefly, ultrathin sections were treated with 0.2% sodium hydroxide in distilled water for 5 min, and then with 0.1% sodium borohydride in 0.01 m Tris-buffered saline (TBS), pH 7.4, for 10 min. After rinsing, ultrathin sections were incubated in 2% human serum albumin (HSA) (Sigma) in TBS containing 0.1% Triton X-100 for 10 min and in the same solution with the addition of 0.05 m glycine for 7 min. Sections were incubated in 2% HSA in TBS for 1.5 h to reduce nonspecific binding and then incubated in the primary antiserum, either rabbit anti-δ subunit (1:100), rabbit anti-γ2 subunit (1:200), guinea pig anti-γ2 subunit (1:2500), or rabbit anti-α4 subunit (1:300), in TBS containing 2% HSA for 18–24 h at room temperature. After a rinse with 0.05 m Tris-HCl buffer containing polyethylene glycol (50 mg/100 ml), sections were incubated for 2.5 h in an appropriate secondary antisera conjugated to 10 nm colloidal gold particles, diluted 1:20 in Tris-HCl buffer (0.05 m, pH 8.0) containing 2% HSA. The secondary antisera were as follows: (1) either goat anti-rabbit IgG fragments, F(ab′)2 (British BioCell International; distributed by Ted Pella, Redding, CA) or goat anti-rabbit IgG (GE Healthcare, Piscataway, NJ); and (2) goat anti-guinea pig IgG (Aurion; distributed by Electron Microscopy Sciences). Sections were then rinsed thoroughly and stained with a saturated solution of uranyl acetate for 40 min and lead citrate for 4 min. The sections were studied and photographed with a JEOL (Akishima, Japan) 100CX II electron microscope. After initial studies of the subcellular localization of δ, α4, and γ2 subunits of the GABAAR, the immunogold labeling associated with symmetric synapses on granule cell dendrites was analyzed in greater detail. Synapses throughout the molecular layer were included in the analyses. Symmetric synaptic contacts were operationally defined as regions with close apposition between an axon terminal and a putative granule cell dendrite at which the presynaptic and postsynaptic membranes were precisely parallel. Such contacts generally included a thin postsynaptic density and some electron-dense material in the cleft between the membranes. For immunogold labeling of the δ subunit, all clearly identifiable symmetric synapses in the molecular layer of the dentate gyrus in several sections from control and experimental specimens were identified and photographed regardless of whether they were labeled or unlabeled. The numbers of synapses with labeling at or near the synaptic contacts were determined and compared in control and pilocarpine-treated animals, and the results were analyzed with a χ2 test to determine statistical differences. For immunogold labeling of α4 and γ2 subunits, randomly selected series of labeled synaptic profiles within the molecular layer were photographed at a primary magnification of 19,000× and a final print magnification of 49,500×. The distribution of subunit labeling at or near symmetric synapses on granule cell dendrites was determined. The ends of the synaptic contacts were defined as the sites at which the presynaptic and postsynaptic membranes were no longer strictly parallel and the postsynaptic density was no longer evident. The location of colloidal gold particles was determined for each symmetric synapse that exhibited immunogold labeling on the postsynaptic structure. The localization of gold particles along the membranes was classified as either of the following: (1) within the central third of the synaptic contact; (2) within the outer third(s) of the synaptic contact; (3) directly at or within 30 nm of the end(s) of the synaptic contact (perisynaptic); or (4) outside the synaptic contact but along the adjacent dendritic membrane at a distance of 30–100 nm from the end of the contact (extrasynaptic). For quantitative analyses, the numbers of gold particles at each location (for each subunit) were determined and compared in pilocarpine-treated and control animals. A total of ∼100 (α4) or 200 (γ2) synapses from control as well as experimental animals (three animals for each condition) were included in the quantitative analyses. Statistical differences were determined by ANOVA, and the level of significance was set at p < 0.05. In later analyses, gold particles within both central and outer thirds of the synaptic contacts were classified as synaptic labeling. Likewise, the perisynaptic and extrasynaptic labeling was combined and referred to as perisynaptic, because relatively little extrasynaptic labeling (operationally defined for this study as 30–100 nm outside the synapse) was observed. Tonic and phasic inhibitions were recorded as described previously (Stell et al., 2003; Wei et al., 2004) in slices prepared from control, pilocarpine-treated, and α5 subunit null mutant C57BL/6 mice. The artificial CSF contained the following (in mm): 126 NaCl, 2.5 KCl, 2 CaCl2, 2 MgCl2, 1.25 NaH2PO4, 26 NaHCO3, 10–25 d-glucose, 0.005 GABA, and 3 kynurenic acid, pH 7.3–7.4, when bubbled with 95% O2/5% CO2. Whole-cell recordings were made at 35 ± 1°C from hippocampal dentate granule cells identified by IR videomicroscopy (Versascope; E. Marton Electronics, Canoga Park, CA) using pipettes filled with the following (in mm): 125 CsCl, 5 NaCl, 2 MgCl2, 10 HEPES, 0.1 EGTA, 2 Na-ATP, 0.5 Na-GTP, and 5 lidocaine N-ethyl bromide quaternary salt, pH 7.25 (280–290 mOsm). The amount of tonic current was measured as described previously (Stell et al., 2003) by subtracting the current in the presence of saturating concentrations of SR 95531 (gabazine). The IPSCs were detected and analyzed using a LabView-based software (EVAN; Thotec, Karlsruhe, Germany). Asynchronous IPSCs were evoked in an artificial CSF in which CaCl2 was replaced with an equimolar SrCl2. The stimulating electrode made of a patch pipette filled with artificial CSF was placed in the mid-molecular layer of the dentate gyrus and was used to deliver 200-μs-long constant current stimuli every 10–15 s. The asynchronous IPSCs were detected in a 100 ms window after the stimulation and were individually measured and averaged using the EVAN software. Unless otherwise indicated, results are expressed as mean ± SEM values for the indicated number of experiments. Data were examined by unpaired and paired two-tailed t tests, and differences between pairs of means were considered significant where p < 0.05. Postembedding immunogold methods, such as those used in this study, allow access of the antisera and other reagents to the entire surface of the sections, but they have limited sensitivity. Thus, colloidal gold labeling is likely to indicate regions with the highest densities of each subunit. Likewise, a lack of labeling could indicate a low density rather than an absence of the subunits. In control specimens that were labeled for the δ subunit, colloidal gold particles were located predominantly near the ends or outer regions of symmetric synapses of dentate gyrus granule cell dendrites in the molecular layer (Fig. 1 A,C). At some synapses, gold particles were present at both ends of the synaptic junction (Fig. 1 A), whereas at others, labeling was detected at only one end of the synaptic contact (Fig. 1 C). These findings replicated our previous ultrastructural localization of the δ subunit in normal C57BL/6 mice (Wei et al., 2003). Electron micrographs of δ subunit immunogold labeling in the dentate molecular layer. A , C , Immunogold particles (arrows) indicate the location of the δ subunit on or near the plasma membrane of dendrites (D) that are in contact with axon terminals (T) in control mice. Gold particles are localized at perisynaptic sites, just outside or at the outer edge of symmetric synapses, and are found at either two ends ( A ) or one end ( C ) of the synaptic contact. Gold particles are not detected at central regions of the synapses ( A , C , open arrowheads). B , D , In specimens from pilocarpine-treated mice, immunogold particles at many symmetric synapses had no immunogold labeling ( D ). When labeling was present, gold particles (arrow) were located at the outer edge of the synapse ( B ), as in controls. E , F , Quantitative analysis of symmetric synapses indicated that a high percentage of symmetric synapses were labeled for the δ subunit in control tissues (80.7%). In contrast, a low percentage of symmetric synapses were labeled for the δ subunit after pilocarpine treatment (18.7%). The δ subunit labeling was significantly less in pilocarpine-treated than in control mice (p < 0.005; χ2 test). Scale bars: A–D , 0.1 μm. Previous light microscopic studies have demonstrated decreased δ subunit labeling in the molecular layer of the dentate gyrus during the chronic period in pilocarpine-treated mice (Peng et al., 2004) and kainate-treated rats (Schwarzer et al., 1997). To verify that the low levels of the δ subunit immunoperoxidase labeling in the dentate molecular layer were accompanied by decreased immunogold labeling at the electron microscopic level, specimens obtained from control and pilocarpine-treated mice were compared for localization of the δ subunit of the GABAAR. Many distinct symmetric synapses showed no immunogold labeling in the pilocarpine-treated mice (Fig. 1 D), consistent with a decrease or absence of the δ subunit at these synapses. For additional analyses of δ subunit localization, a random series of distinct symmetric synapses (labeled and unlabeled) in the molecular layer was collected from specimens of control and pilocarpine-treated mice. Quantitative analysis demonstrated that a high percentage of symmetric synapses was labeled for the δ subunit in controls (Fig. 1 E) (80.7%; 88 of 109 synapses). In contrast, a low percentage of symmetric synapses was labeled for the δ subunit in pilocarpine-treated mice (Fig. 1 F) (18.7%; 20 of 107 synapses), with a high percentage of symmetric synapses remaining unlabeled for the δ subunit (Fig. 1 F). The number of δ subunit-labeled synapses was significantly different in pilocarpine-treated and control mice (p < 0.005). In the limited number of synapses that were labeled for the δ subunit in pilocarpine-treated mice, 98% of the gold particles were located at perisynaptic (88%) (Fig. 1 B) and extrasynaptic (10%) sites. Thus, when present, the δ subunit labeling closely resembled that in control animals. To determine the possible functional correlates of the decreased levels of δ subunits in dentate gyrus granule cells in pilocarpine-treated mice, we recorded the tonic inhibition in these neurons. This type of inhibition is known to be mediated predominantly by such receptors in mouse dentate gyrus granule cells (Stell et al., 2003), and therefore, we expected a decrease in the magnitude of tonic inhibition in these cells. Unpredictably, there was no significant difference between the magnitude of the tonic inhibition recorded in control and pilocarpine-treated granule cells (Fig. 2). The mean tonic inhibitory current was 29.5 ± 5.4 pA in control cells (n = 20) and 27.8 ± 5.4 pA in granule cells (n = 22) of pilocarpine-treated animals (p = 0.82; unpaired t test). Tonic inhibition in granule cells of control and pilocarpine-treated mice. A , The two raw traces at the top originate from a granule cell each recorded in slices obtained from a control and a pilocarpine-treated (Pilo) mouse, respectively. The tonic currents were measured as described in Materials and Methods. The horizontal bar indicates the perfusion of saturating concentrations of SR 95531 (gabazine) to block both tonic and phasic conductance. B , The box plots summarize the average tonic currents recorded in the two preparations in symmetrical Cl− concentrations at a holding potential of −70 mV. For each box plot, the asterisks represent the two outliers, and the □ within the box is the mean. The error bars represent SEM, and the top and bottom boundaries of the box depict the 75 and 25% of the distribution, respectively. There is no significant difference between the mean tonic currents recorded in the two preparations. A hallmark of the tonic inhibition mediated by δ subunit-containing GABAARs is its sensitivity to low (nm) concentrations of neurosteroids (Stell et al., 2003). We reasoned that if the tonic inhibition in the granule cells of pilocarpine-treated animals is no longer mediated by δ subunit-containing GABAARs, the tonic inhibition recorded in these cells should no longer be sensitive to neurosteroids such as tetrahydrodeoxy-corticosterone (THDOC). Indeed, as shown previously (Stell et al., 2003; Maguire and Mody, 2007), the tonic inhibition of control granule cells was enhanced after perfusion of 10 nm THDOC, which was not seen in cells of pilocarpine-treated animals (Fig. 3 A). When the effect of THDOC was compared in each recorded neuron (Fig. 3 B), the paired t test indicated a significant effect (p = 0.00025; n = 10) in control granule cells amounting to a 56.3 ± 13.7% potentiation (Fig. 3 C). When the tonic current recorded before perfusion of THDOC was plotted against that recorded after its perfusion in the two preparations (Fig. 3 D), the graph showed that the potentiation in control granule cells took place regardless of the magnitude of the initial tonic current. The tonic currents recorded in pilocarpine-treated granule cells did not become potentiated by THDOC, although these currents were in the ranges seen in the control cells. These data are consistent with the loss of δ subunits from pilocarpine-treated granule cells, thus resulting in a neurosteroid-insensitive tonic current. Differential sensitivities of the tonic currents recorded in dentate granule cells of control and pilocarpine-treated mice to the neurosteroid THDOC. A , The two raw traces originate from a granule cell, each recorded in slices obtained from a control (left) and a pilocarpine-treated (right) mouse, respectively. The horizontal bars indicate the perfusion of the drugs. Note the increase in tonic current in the control cell after perfusion of 10 nm THDOC. 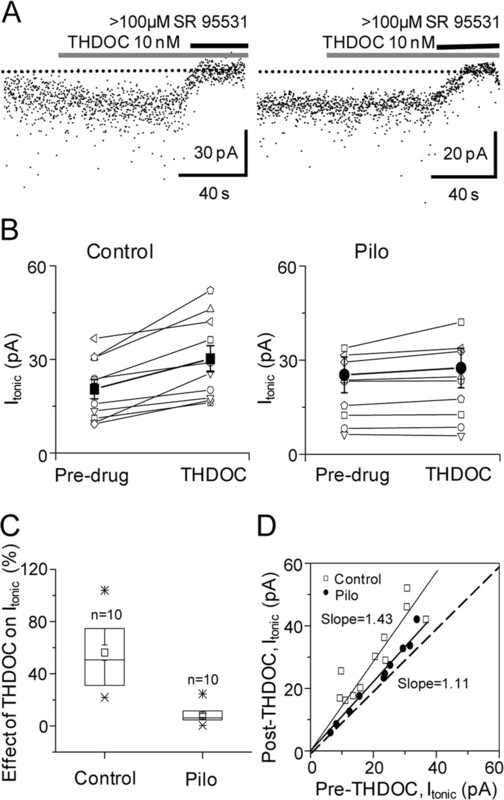 No such effect of THDOC is present in the neuron of the pilocarpine-treated mouse. B , Paired plots of the tonic currents before and after the perfusion of THDOC in control and pilocarpine-treated (Pilo) mice. The effect of THDOC was significant only in the control mice (p = 0.00025, paired t test; where the mean tonic current was increased from 20.5 ± 2.8 to 30.2 ± 3.7 pA, n = 10; in Pilo animals, the values were 25.3 ± 3.2 pA pre-THDOC vs 27.5 ± 5.7 pA in THDOC, n = 10; p = 0.13, paired t test). Thick lines and symbols indicate mean ± SEM. C , As shown in the box plots, the effect of THDOC was to increase the tonic current by 56.3 ± 13.7% in control granule cells, which was significantly different (p = 0.005; unpaired t test) from its effect on granule cells of pilocarpine-treated mice (8.1 ± 2.2%). The notations of the box plots are as described in the legend of Figure 2. D , The linear slope analysis of the tonic current (I tonic) values before and after THDOC treatment also shows a significant effect in control (slope, 1.43) but not in pilocarpine-treated mice (slope, 1.11). This graph also indicates that the effect of THDOC was independent from the original magnitude of the tonic current. Usually, in native GABAARs, δ and γ2 subunits appear to be mutually exclusive and are responsible for the absence or presence of benzodiazepine (BZ) sensitivity, respectively (Shivers et al., 1989). We wanted to compare the BZ sensitivities of the tonic inhibitions between control and pilocarpine-treated granule cells to reveal possible differences between the mo-lecular composition of the underlying GABAARs. Surprisingly, perfusion of 1 μm DZ enhanced the tonic inhibition in both control and pilocarpine-treated granule cells (Fig. 4 A). When the effect of DZ was compared in each recorded neuron (Fig. 4 B), the paired t test indicated a significant effect (p = 0.003; n = 7) in control granule cells amounting to a 61.2 ± 9.4% potentiation (Fig. 4 C) and a similar effect (p = 0.02; n = 7) in pilocarpine-treated neurons corresponding to a 59.4 ± 5.0% potentiation by DZ (Fig. 4 C). In both preparations, plotting the tonic current recorded before perfusion of DZ against that recorded after its perfusion (Fig. 4 D) showed that the DZ-induced potentiation was independent of the magnitude of the initial tonic current. Similar sensitivities of the tonic currents recorded in dentate granule cells of control and pilocarpine-treated mice to the benzodiazepine DZ. A , The two raw traces originate from a granule cell each recorded in slices obtained from a control (left) and a pilocarpine-treated (right) mouse, respectively. The horizontal bars indicate the perfusion of the drugs. Note the increase in tonic current in both the control and the pilocarpine-treated cells after perfusion of 1 μm DZ. B , Paired plots of the tonic currents before and after the perfusion of DZ in control and pilocarpine-treated (Pilo) mice. The effect of DZ was significant in both the control (p = 0.003, paired t test; from 19.7 ± 4.9 to 30.4 ± 7.0 pA in DZ; n = 7) and pilocarpine-treated mice (p = 0.02, paired t test; from 20.0 ± 5.7 to 32.7 ± 9.7 pA in DZ; n = 7). Thick lines and symbols indicate mean ± SEM. 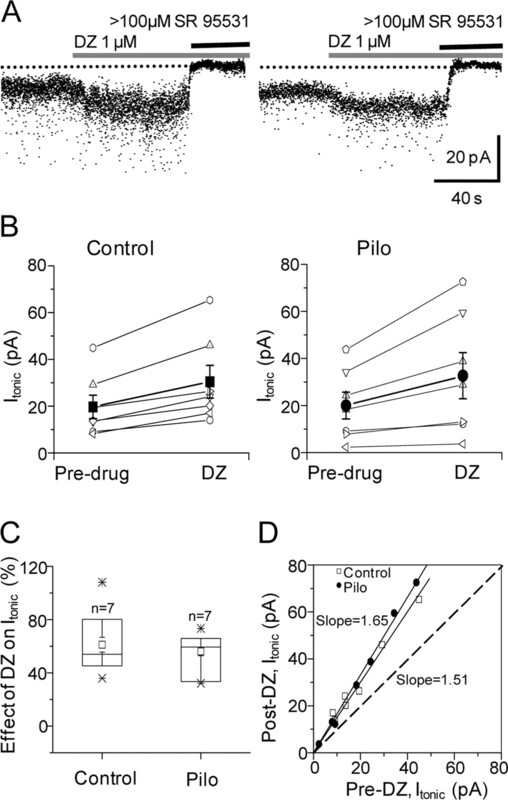 C , As shown in the box plots, the effect of DZ was to increase the tonic current by 61.2 ± 9.4% in control granule cells, which was not significantly different (p > 0.5; unpaired t test) from its effect on granule cells of pilocarpine-treated mice (59.4 ± 5.0%). The notations of the box plots are as described in Figure 2. D , The linear slope analysis of the tonic current (I tonic) values before and after DZ treatment also shows a significant effect in both control (slope, 1.51) and pilocarpine-treated mice (slope, 1.65). This graph also indicates that the effect of DZ was independent from the original magnitude of the tonic current. The DZ-induced potentiation of the tonic current in control granule cells is somewhat surprising in light of the lack of potentiation of the tonic current recorded in rat granule cells by zolpidem (Nusser and Mody, 2002). However, zolpidem is a nonbenzodiazepine modulator of GABAARs with little effect on α5 subunit-containing GABAARs, whereas DZ also potentiates the α5 subunit-containing GABAARs (Hevers and Luddens, 1998). Therefore, it is possible that a portion of the tonic inhibition in control dentate gyrus granule cells is mediated by α5 subunit-containing GABAARs. Indeed, perfusion of DZ in α5 subunit null mutant dentate gyrus granule cells produced no enhancement of the tonic current (25.6 ± 3.9 pA in pre-DZ and 27.4 ± 4.7 pA in DZ; n = 5 cells; p = 0.53, two-tailed paired t test). Therefore, we conclude that a portion of the tonic current in control mouse dentate gyrus granule cells is mediated by α5 subunit-containing GABAARs. However, the portion of the tonic current mediated by these receptors must remain the same after pilocarpine treatment, because the magnitude of tonic current potentiation by DZ was similar between control and pilocarpine-treated granule cells. The persistent tonic inhibition in pilocarpine-treated mice and the loss of neurosteroid modulation of this inhibition suggested that GABAARs that lack the δ subunit could be contributing to the tonic inhibition. Because of the presumed close partnership between α4 and δ subunits in normal dentate gyrus granule cells, we examined the localization of the α4 subunit of GABAA receptors to determine whether the subcellular localization of this subunit was altered in conjunction with the decrease in δ subunit labeling. In control specimens, colloidal gold labeling of the α4 subunit was present at perisynaptic sites in the dentate molecular layer (Fig. 5 A,C) and closely resembled the δ subunit labeling in control tissue. Gold particles were found predominantly at the outer edges of symmetric synapses rather than at the center of these synapses (Fig. 5 A,C). Postembedding immunogold labeling of the α4 subunit of the GABAA receptor in the dentate molecular layer. 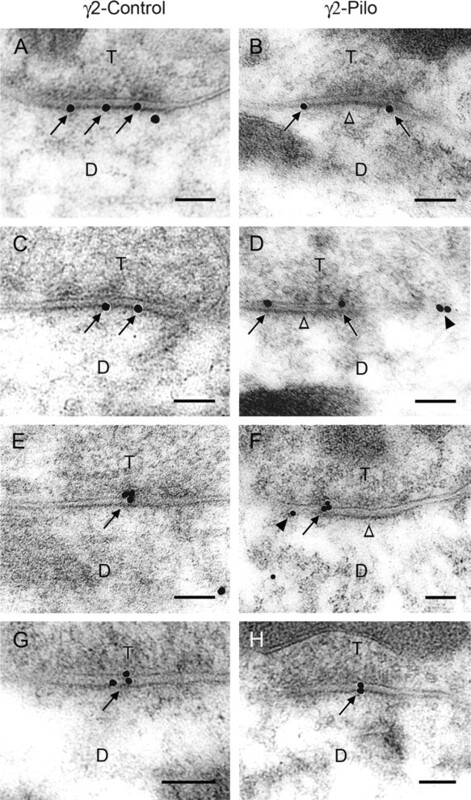 A , C , In control mice, colloidal gold labeling of the α4 subunit (arrows) is present on or near the plasma membrane of dendrites (D) that are contacted by axon terminals (T). Gold particles are found predominantly at the outer edges of symmetric synapses (arrows) but not at the center of these synapses (open arrowheads). B , D , In pilocarpine-treated mice, α4 subunit labeling continues to be located predominantly at perisynaptic sites (arrows) in the dentate molecular layer and not near the center of the synapse (open arrowheads). E , A schematic drawing of the synapse in D illustrates the subdivisions of the synaptic region into central third (1), outer third (2), perisynaptic (3), and extrasynaptic (4) regions that were used to describe gold particle localization in the quantitative analyses. F , Quantitative analysis showed that 73.6% of immunogold particles were found at perisynaptic sites (3) of α4 subunit-labeled synapses (open bar) in control mice. In pilocarpine-treated mice, 76.7% of gold particles were found at perisynaptic sites. Gold particle labeling at perisynaptic sites was not statistically different between control and pilocarpine-treated groups. Error bars represent SEM. Scale bars: A–D , 0.1 μm. In specimens obtained from pilocarpine-treated mice, the localization of the α4 subunit appeared unchanged in the dentate molecular layer. Gold particles were evident at perisynaptic sites near symmetric synapses (Fig. 5 B,D). In further analysis of the α4 subunit localization, a series of randomly selected synapses that exhibited α4 subunit labeling in the molecular layer was examined. At these labeled synapses, the location of the gold particles was determined to be as follows: (1) synaptic, central third; (2) synaptic, outer third(s); (3) perisynaptic; or (4) extrasynaptic (Fig. 5 E). Quantitative analyses showed that 73.6% of the immunogold particles were found at perisynaptic sites of the α4 subunit-labeled synapses in control mice (Fig. 5 F) (n = 3 mice; 123 labeled synapses with 245 gold particles), whereas in pilocarpine-treated specimens, 76.7% of the immunogold particles were found at perisynaptic sites of α4 subunit-labeled synapses (Fig. 5 F) (n = 3 mice; 90 labeled synapses with 204 gold particles). The gold particle labeling at perisynaptic locations was not statistically different between control and pilocarpine-treated groups. Previous studies have suggested that the δ and γ2 subunits may compete for partnership with the α4 subunit (Tretter et al., 2001; Korpi et al., 2002). Because the δ subunit is decreased and the γ2 subunit is increased in the dentate gyrus of pilocarpine-treated mice (Peng et al., 2004), we examined γ2 subunit labeling to determine whether the ultrastructural localization of the γ2 subunit was altered in pilocarpine-treated mice. In control specimens, colloidal gold labeling of the γ2 subunit was present directly at symmetric synapses (Fig. 6 A,C,E,G). Two major patterns were observed. In the first, gold particles were dispersed along the postsynaptic membrane of granule cell dendrites (Fig. 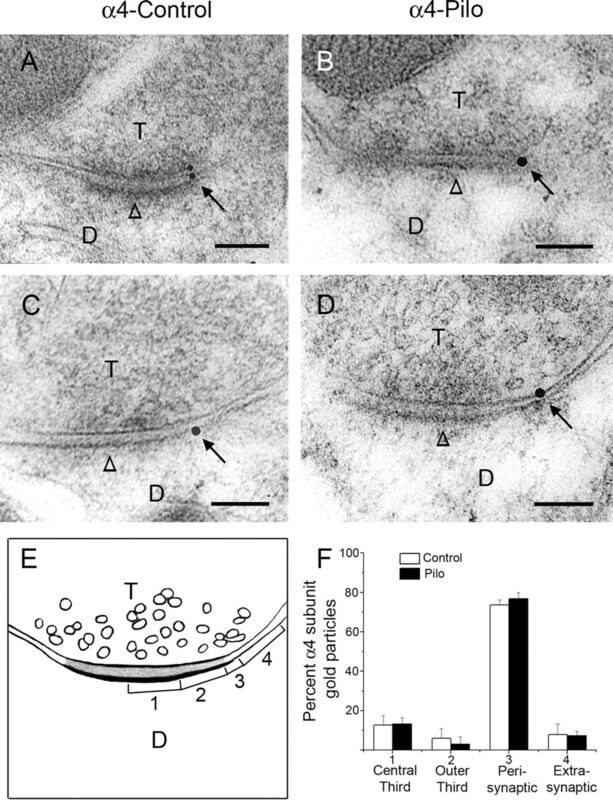 6 A,C), whereas in the second, gold particles were concentrated near the center of the postsynaptic membrane of symmetric synapses of the granule cell dendrites (Fig. 6 E,G). Colloidal gold particles were generally not detected at perisynaptic locations in the control specimens (Fig. 6 A,C,E,G). However, in pilocarpine-treated mice, colloidal gold particles were evident at perisynaptic sites of many symmetric synapses in the molecular layer (Fig. 6 B,D,F). At some synapses, immunogold particles were visualized at both ends of the labeled synapse (Fig. 6 B,D), whereas at others, gold particles were detected at one end (Fig. 6 F), and the patterns closely resembled the normal location of δ and α4 subunits (compare Fig. 6 B,D,F with Fig. 1 A,C and Fig. 5 A,C). Colloidal gold particles were often not detected in the center of these labeled synapses (Fig. 6 B,D,F). However, in some labeled synapses of pilocarpine-treated mice, gold particles were confined to the center of the synapses (Fig. 6 H), but such labeled synapses were fewer than in control specimens. Postembedding immunogold labeling of the γ2 subunit of GABAA receptors in the dentate molecular layer of control mice ( A , C , E , G ) and pilocarpine-treated mice ( B , D , F , H ). In control mice, immunogold particles (arrows) that indicate the location of the γ2 subunit are either dispersed along the postsynaptic membrane ( A , C ) or are highly concentrated near the center of the postsynaptic membrane ( E , G ). In contrast, in pilocarpine-treated mice, gold particles are located at perisynaptic sites (arrows) in many labeled synapses but not at the center of these synapses (open arrowheads) in B , D , and F . Gold particles are evident at either two ends ( B , D ) or one end ( F ) of labeled synapses. This resembles the normal localization of δ and α4 subunits (see Figs. 1 A,C, 5 A,C). D , F , Gold particles at extrasynaptic sites (arrowheads) are present near some perisynaptically labeled synapses. H , At some labeled synapses, gold particles are located at the center of the synapses in pilocarpine-treated animals, as in control animals. Scale bars: A–H , 0.1 μm. Additional analysis of γ2 subunit localization was conducted in a series of randomly selected synapses that exhibited γ2 subunit labeling in the molecular layer. At these labeled synapses, labeling within four subdivisions of the synaptic region was determined, as for the α4 labeling (for schematic drawing, see Fig. 5 E). In control specimens, 62.8% of the gold particles was found in the central third and 28.6% was found in the outer thirds (Fig. 7 A) (n = 3 mice) of the synaptic contact. Thus, 91.4% of the total γ2 subunit labeling was found directly at synapses in the control mice (Fig. 7 B). In contrast, in pilocarpine-treated mice, the percentage of gold particles decreased to 22.2% in the central third and to 12.7% in the outer thirds of symmetric synapses (Fig. 7 A). Thus, the synaptically located γ2 subunit labeling represented only 34.9% of the total gold particles in pilocarpine-treated mice (Fig. 7 B), suggesting a reduction of synaptic γ2-containing GABAA receptors in pilocarpine-treated mice. In contrast, gold particles at perisynaptic and extrasynaptic locations were increased to 58.1 and 7.0%, respectively, in the pilocarpine-treated mice (Fig. 7 A). Because of the small amount of extrasynaptic labeling, the perisynaptic and extrasynaptic gold particles were combined and classified as perisynaptic labeling. This represented 65.1% of the total gold particles in pilocarpine-treated mice (Fig. 7 B) and suggested the perisynaptic γ2-containing GABAARs had increased at the expense of synaptic γ2-containing GABAARs in the pilocarpine-treated mice (Fig. 7 A,B). Statistical analysis indicated significant differences between the numbers of gold particles in control and pilocarpine-treated groups at the central third (p < 0.01), outer thirds (p < 0.05), and perisynaptic (p < 0.001) locations (Fig. 7 A). Quantitative analysis of γ2 subunit immunolabeling in subdivisions of labeled synapses. A , The percentage of gold particles at the central third of labeled synapses decreased from 62.8% in control to 22.2% in pilocarpine-treated mice (**p < 0.01). Likewise, the percentage of gold particles at the outer thirds of labeled synapses decreased from 28.6% in control to 12.7% in pilocarpine-treated mice (*p < 0.05). In contrast, the percentage of gold particles at perisynaptic locations increased from 6.5% in control to 58.1% in pilocarpine-treated mice (***p < 0.001). No statistically significant difference was found in extrasynaptic labeling between control and pilocarpine-treated mice (n.s.). Error bars represent SEM. ***p < 0.001; **p < 0.01; *p < 0.05. B , A summary of the γ2 subunit labeling indicates that gold particles located directly at the synaptic contact (sum of those at the central and outer thirds of labeled synapses) represented 91.4% of gold particles in control but only 34.9% in pilocarpine-treated mice. However, perisynaptic γ2 subunit labeling (sum of gold particles at perisynaptic and extrasynaptic locations) increased from 8.6% in control to 65.1% in pilocarpine-treated mice. As shown in the previous section, the shift in γ2 receptor subunit distribution from synaptic to perisynaptic sites takes place in the dendrites of pilocarpine-treated granule cells, where δ subunit labeling has decreased. Such net movement of γ2 subunits to perisynaptic sites would be expected to reduce synaptic (phasic) inhibition. However, measurement of dendritic synaptic inhibition is difficult in granule cells because in these neurons, most, if not all, sIPSCs originate from synapses close to the soma (Soltesz et al., 1995). To investigate the properties of inhibitory synapses in the dendrites of granule cells, we resorted to a technique measuring the asynchronous release of transmitter from stimulated nerve terminals when extracellular Ca2+ is replaced with equimolar Sr2+ (Oliet et al., 1996; Morishita and Alger, 1997; Rumpel and Behrends, 1999). Stimulating the dendritic GABAergic afferents in the presence of Sr2+, asynchronous IPSCs could be evoked in granule cells of both control and pilocarpine-treated animals (Fig. 8 A). In contrast to the sIPSCs of mainly somatic origin that were similar between the two preparations (Fig. 8 B), the asynchronous Sr-IPSCs, measured in a 100 ms window after stimulation, were reduced in the pilocarpine-treated granule cells (Fig. 8 B) from an average of 42.1 ± 6.0 pA (control; n = 11 cells) to 30.2 ± 3.1 pA (pilo; n = 11 cells; p = 0.005, two-tailed unpaired t test) (Fig. 8 C). This reduction in dendritic synaptic inhibition was also evident from the cumulative probability plots of Sr-IPSC amplitudes (Fig. 8 D). These data are consistent with a loss of γ2 subunits from the granule cell dendritic inhibitory synapses in pilocarpine-treated mice. Reduction of synaptic inhibition in the dendrites of granule cells in pilocarpine-treated mice. A , Ten superimposed traces of asynchronous IPSCs evoked in the presence of 2 mm Sr2+ recorded in a control and a pilocarpine-treated (Pilo) granule cell. The areas shaded in gray indicate the 100 ms time windows after the stimulation in the molecular layer, during which the asynchronous IPSCs were detected and analyzed. The single expanded trace is an example of the events during the 100 ms window. B , Averaged sIPSCs (left) recorded in a representative control and a pilocarpine-treated granule cell were superimposable. In contrast, the averaged asynchronous IPSCs (Sr-IPSCs) evoked by stimulation of dendritic afferents (right) in two different cells were smaller in the pilocarpine-treated granule cell. 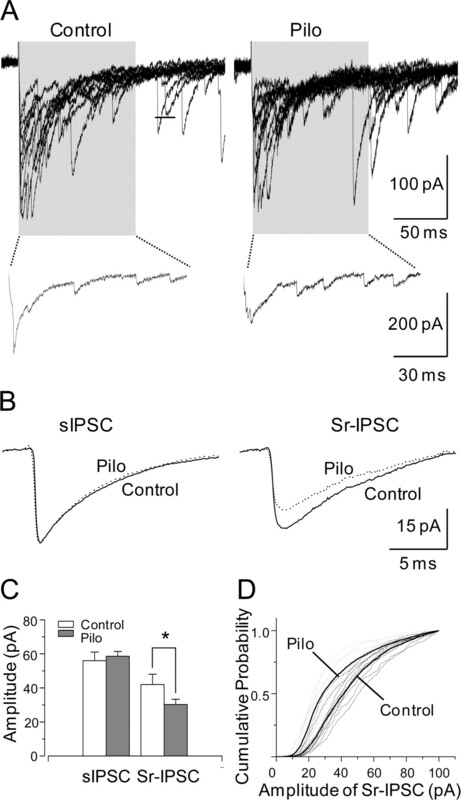 C , Summary data showing the similarity between the average amplitudes of sIPSCs recorded in the two preparations (56.1 ± 5.0 pA in control; 58.6 ± 2.8 pA in Pilo; p = 0.7, unpaired t test) and the smaller amplitude Sr-IPSCs (p = 0.005; unpaired t test) in the pilocarpine-treated granule cells (42.1 ± 6.0 pA, n = 11 cells in control; 30.2 ± 3.1 pA, n = 11 cells in Pilo). D , Individual cumulative probability plots of the Sr-IPSCs recorded in control (thin black lines) and pilocarpine-treated granule cells (thin gray lines). The cumulative plots of all the events are indicated by thick black lines for both preparations. Note the significantly larger Sr-IPSCs in control preparations indicating larger synaptic inhibition in the dendrites of control granule cells than that of the pilocarpine-treated animals. We identified two unique alterations in the subcellular localization of GABAAR subunits and related electrophysiology that could impair dendritic inhibition in the dentate gyrus of mice with TLE. First, δ subunit labeling decreased at perisynaptic locations on granule cell dendrites in pilocarpine-treated mice, and this change was associated with a substantial decrease in the normal enhancement of tonic inhibition by the neurosteroid THDOC. In addition, the localization of the γ2 subunit changed from predominantly synaptic in control to perisynaptic in pilocarpine-treated mice, and this morphological change was accompanied by a decrease in phasic synaptic inhibition at granule cell dendrites in the epileptic animals. 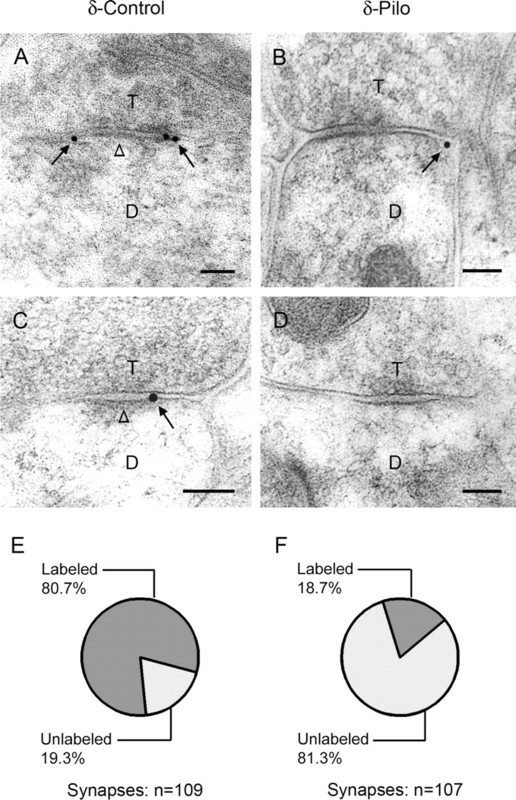 The marked decrease in δ subunit labeling at perisynaptic locations on granule cell dendrites is consistent with previous light microscopic findings of decreased δ subunit labeling throughout the molecular layer of the dentate gyrus (Schwarzer et al., 1997; Peng et al., 2004) and decreased δ subunit mRNA in several TLE models (Tsunashima et al., 1997; Elliott et al., 2003; Nishimura et al., 2005). Contrary to our expectations based on the major role of δ subunit-containing GABAARs in mediating tonic inhibition in the dentate gyrus (Nusser and Mody, 2002; Stell et al., 2003), tonic GABAergic inhibition was maintained in granule cells of pilocarpine-treated mice, but its regulation was altered. Neurosteroid enhancement of the tonic inhibition was substantially reduced in the epileptic animals, most likely related to the loss of neurosteroid-sensitive δ subunits (Stell et al., 2003) and consistent with our previous findings of decreased THDOC modulation of field potentials in pilocarpine-treated mice (Peng et al., 2004). Mtchedlishvili et al. (2001) also found diminished sensitivity of GABAARs to the neurosteroid allopregnanolone in acutely dissociated dentate granule cells from epileptic rats 4–6 weeks after SE. Such deficits in the normal modulation of tonic inhibition in the dentate gyrus could limit the adaptive response of the GABA system to increased excitability, particularly at times of altered hormonal levels or increased stress (Maguire et al., 2005; Maguire and Mody, 2007). Maintained tonic inhibition in the dentate gyrus of pilocarpine-treated animals, despite substantial decreases in δ subunit expression, suggests that GABAARs without δ subunits mediate the tonic current. These could be reorganized receptors with altered subunit partners or other GABAARs that normally participate in tonic inhibition in this region. In native GABAARs, δ and γ2 subunits appear to be mutually exclusive (Shivers et al., 1989; Araujo et al., 1998) and may compete with each other for partnership with the α4 subunit (Sur et al., 1999; Tretter et al., 2001). Thus, when δ subunit expression decreases in the epileptic mice, the γ2 subunit could increase its partnership with the α4 subunit. We identified changes in γ2 subunit localization that are consistent with such an altered partnership. In contrast to its normal synaptic location, the γ2 subunit was frequently located perisynaptically in the epileptic animals and thus was appropriately positioned for partnership with the α4 subunit, which remained in its normal perisynaptic location. Although similar localization of the two subunits does not indicate their presence in the same receptor, such localization would be necessary for partnership. Findings from δ subunit-deficient mice provide independent support for such a partnership: γ2 subunit expression increases specifically in regions where the δ subunit is normally most abundant, and coimmunoprecipitation of α4 and γ2 subunits is increased (Tretter et al., 2001; Korpi et al., 2002; Peng et al., 2002). Our current findings are consistent with replacement of α4βδ receptors with α4βγ2 receptors at perisynaptic locations in the epileptic mice. Such changes in subunit composition could alter GABAAR properties (Lagrange et al., 2007), including a reduced sensitivity to GABA in the absence of δ subunits (Saxena and Macdonald, 1994). In engineered cell lines, α4β3δ receptors have a substantially higher affinity for GABA and slower desensitization than α4β3γ2 receptors (Brown et al., 2002). If the latter receptors were located perisynaptically, they could be less sensitive to ambient levels of GABA or spillover of GABA onto perisynaptic sites. An alternate possibility is that, after loss of the δ subunit, α4 subunit-containing receptors consist of only α and β subunits. Such αβ GABAARs have been suggested to mediate tonic inhibition in the rat CA1 region, although they appear to account for only a small fraction of the tonic current (Mortensen and Smart, 2006). A subpopulation of native α4-containing receptors in the rat does not contain either δ or γ2 (Bencsits et al., 1999), and thus associations of α4 subunits with only β subunits or with other subunits cannot be ruled out. The perisynaptic γ2 subunits in pilocarpine-treated animals could form partnerships with subunits other than α4, and the sensitivity of these receptors to diazepam could provide clues to their subunit composition. Although the γ2 subunit is required for benzodiazepine sensitivity (Pritchett et al., 1989), GABAARs that contain the α4 subunit are generally insensitive to diazepam, even when γ2 is present (Wisden et al., 1991; Benke et al., 1997). Our data are consistent with the idea that a portion of the tonic inhibition in the normal dentate gyrus is mediated by α5βγ2-containing GABAARs. If the contribution of α5βγ2 GABAARs to tonic inhibition were to be increased in pilocarpine-treated mice, diazepam potentiation of the tonic current would be expected to increase proportionally in the epileptic animals because of loss of the diazepam-insensitive (α4βδ) receptors. Because this did not occur, DZ-insensitive receptors (α4βγ2?) appear to be mediating a portion of the tonic current originally mediated by δ subunit-containing GABAARs. Electron microscopic analysis of α5 subunit labeling was not possible because of limited availability of specific antisera. However, our previous light microscopic studies of a limited number of pilocarpine-treated mice revealed a decrease in α5 labeling in the molecular layer, as in other regions of the hippocampus (Z. Peng and C. R. Houser, unpublished findings). Increased perisynaptic γ2 subunit labeling in the pilocarpine-treated mice was accompanied by a striking decrease in γ2 subunit labeling near the center of synapses. 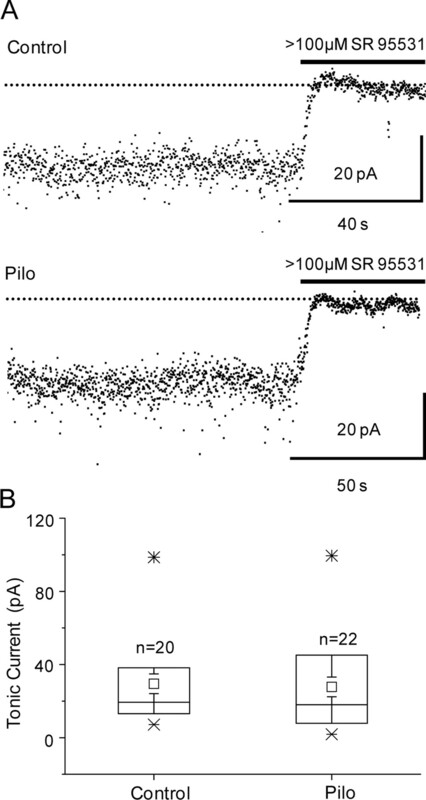 This unexpected alteration in γ2 localization led us to compare dendritic phasic inhibition of pilocarpine and control animals by eliciting an asynchronous release of GABA by local stimulation of axon terminals in the molecular layer in the presence of Sr2+. Because the asynchronous release under these conditions occurs only from the stimulated terminals (Oliet et al., 1996; Morishita and Alger, 1997; Rumpel and Behrends, 1999), the method revealed a significant decrease in dendritic synaptic inhibition of granule cells from pilocarpine-treated animals. This finding is consistent with a decrease in γ2 subunit-containing receptors directly at synaptic contacts, because the γ2 subunit is normally incorporated in most synaptic GABAARs (Somogyi et al., 1996; Sassoè-Pognetto et al., 2000). Although inhibition in the dentate gyrus has been studied extensively in epilepsy models, the findings have varied, with reports of increased inhibition (Gibbs et al., 1997; Nusser et al., 1998a; Coulter, 2001), increased inhibition with altered pharmacology (Buhl et al., 1996; Coulter, 2001; Cohen et al., 2003), and reduced inhibition (Kobayashi and Buckmaster, 2003; Shao and Dudek, 2005) of granule cells during the chronic period. The different findings could be related to the parameters of inhibition that were evaluated and the location of this inhibition (i.e., somatic or dendritic). Whereas somatic inhibition is generally assessed by recording spontaneous or miniature IPSCs (Soltesz et al., 1995), ultrastructural studies have indicated that ∼75% of all GABAergic synapses in the dentate gyrus are found on granule cell dendrites and only 25% on granule cell somata (Halasy and Somogyi, 1993). Additionally, high densities of many GABAAR subunits are found in the dentate molecular layer (Fritschy and Mohler, 1995; Sperk et al., 1997), consistent with the functional importance of inhibition in this region. A decrease in dendritic inhibition, despite preservation of somatic inhibition, has also been identified in CA1 pyramidal cells in the rat pilocarpine model, although these deficits were attributed to decreased GABAergic innervation of the dendrites (Cossart et al., 2001). In this epilepsy model, tonic inhibition was maintained but modified, and synaptic inhibition was decreased at dendrites, potentially because of the shift of the γ2 subunit away from the center of the synapse. Thus, tonic inhibition with a different pharmacology appears to be preserved in granule cells but possibly at the expense of phasic inhibition in the granule cell dendrites. Previous studies have also described a persistence of tonic inhibition in CA1 pyramidal cells in the rat pilocarpine model (Scimemi et al., 2005), although there is a marked decrease in the α5 subunit that mediates much of the normal tonic inhibition in CA1 (Houser and Esclapez, 2003; Scimemi et al., 2005). Despite the lack of a demonstrable decrease in tonic inhibition, it is intriguing that the subunits associated with tonic inhibition often show the most robust and consistent decreases in TLE models. The particular morphological and functional changes in GABAARs identified in this study could limit the ability of the inhibitory system to respond adaptively when excitability increases. Such impairments of GABAAR function could contribute to the epileptic condition and its periodic nature. This work was supported by Veterans Affairs Medical Research Funds (C.R.H.) and by National Institutes of Health Grants NS051311 (C.R.H. ), NS002808 (I.M. ), and NS035985 (I.M., R. W. Olsen). We thank Zechun Peng and Christine Huang for expert assistance with tissue preparation, Drs. Werner Sieghart and Jean-Marc Fritschy for generously providing antisera to the GABAA receptor subunits, and Dr. Richard W. Olsen for helpful discussions throughout the studies. (1998) Absence of association between δ and γ2 subunits in native GABAA receptors from rat brain. Eur J Pharmacol 347:347–353. (1999) A significant part of native γ-aminobutyric acidA receptors containing α4 subunits do not contain γ or δ subunits. J Biol Chem 274:19613–19616. (1997) GABAA receptors containing the α4-subunit: prevalence, distribution, pharmacology, and subunit architecture in situ. J Neurochem 69:806–814. (1998) Selective changes in single cell GABAA receptor subunit expression and function in temporal lobe epilepsy. Nat Med 4:1166–1172. (1996) Zinc-induced collapse of augmented GABAergic inhibition in a temporal lobe epilepsy model. Science 271:369–373. (2006) GABAA receptor α4 subunits mediate extrasynaptic inhibition in thalamus and dentate gyrus and the action of gaboxadol. Proc Natl Acad Sci USA 103:15230–15235. (2003) Dentate granule cell GABAA receptors in epileptic hippocampus: enhanced synaptic efficacy and altered pharmacology. Eur J Neurosci 17:1607–1616. (2001) Dendritic but not somatic GABAergic inhibition is decreased in experimental epilepsy. Nat Neurosci 4:52–62. (2001) Epilepsy-associated plasticity in γ-aminobutyric acid receptor expression, function, and inhibitory synaptic properties. Int Rev Neurobiol 45:237–252. (2003) Overlapping microarray profiles of dentate gyrus gene expression during development- and epilepsy-associated neurogenesis and axon outgrowth. J Neurosci 23:2218–2227. (1999) GABAergic neurons and GABAA-receptors in temporal lobe epilepsy. Neurochem Int 34:435–445. (1997) Differential epilepsy-associated alterations in postsynaptic GABAA receptor function in dentate granule and CA1 neurons. J Neurophysiol 77:1924–1938. (2006) Hippocampal network hyperactivity after selective reduction of tonic inhibition in GABAA receptor α5 subunit-deficient mice. J Neurophysiol 95:2796–2807. (1993) Distribution of GABAergic synapses and their targets in the dentate gyrus of rat: a quantitative immunoelectron microscopic analysis. J Hirnforsch 34:299–308. (1998) The diversity of GABAA receptors. Pharmacological and electrophysiological properties of GABAA channel subtypes. Mol Neurobiol 18:35–86. (2003) Downregulation of the α5 subunit of the GABAA receptor in the pilocarpine model of temporal lobe epilepsy. Hippocampus 13:633–645. (1998) Subunit composition and quantitative importance of hetero-oligomeric receptors: GABAA receptors containing α6 subunits. J Neurosci 18:2449–2457. (2003) Reduced inhibition of dentate granule cells in a model of temporal lobe epilepsy. J Neurosci 23:2440–2452. (2002) Altered receptor subtypes in the forebrain of GABAA receptor δ subunit-deficient mice: recruitment of γ2 subunits. Neuroscience 109:733–743. (2007) Enhanced macroscopic desensitization shapes the response of alpha4 subtype-containing GABAA receptors to synaptic and extrasynaptic GABA. J Physiol (Lond) 578:655–676. (2006) Chronic intermittent ethanol-induced switch of ethanol actions from extrasynaptic to synaptic hippocampal GABAA receptors. J Neurosci 26:1749–1758. (2000) Selective alterations in GABAA receptor subtypes in human temporal lobe epilepsy. J Neurosci 20:5401–5419. (2007) Neurosteroid synthesis-mediated regulation of GABAA receptors: relevance to the ovarian cycle and stress. J Neurosci 27:2155–2162. (2005) Ovarian cycle-linked changes in GABAA receptors mediating tonic inhibition alter seizure susceptibility and anxiety. Nat Neurosci 8:797–804. (1997) Sr2+ supports depolarization-induced suppression of inhibition and provides new evidence for a presynaptic expression mechanism in rat hippocampal slices. J Physiol (Lond) 505:307–317. (2001) Diminished allopregnanolone enhancement of GABAA receptor currents in a rat model of chronic temporal lobe epilepsy. J Physiol (Lond) 537:453–465. (2005) Altered expression of GABAA and GABAB receptor subunit mRNAs in the hippocampus after kindling and electrically induced status epilepticus. Neuroscience 134:691–704. (1998a) Increased number of synaptic GABAA receptors underlies potentiation at hippocampal inhibitory synapses. Nature 395:172–177. (1998b) Segregation of different GABAA receptors to synaptic and extrasynaptic membranes of cerebellar granule cells. J Comp Neurol 18:1693–1703. (1996) Bidirectional control of quantal size by synaptic activity in the hippocampus. Science 271:1294–1297. (2002) GABAA receptor changes in δ subunit-deficient mice: altered expression of α4 and γ2 subunits in the forebrain. J Comp Neurol 446:179–197. (2004) Altered expression of the δ subunit of the GABAA receptor in a mouse model of temporal lobe epilepsy. J Neurosci 24:8629–8639. (1989) Importance of a novel GABAA receptor subunit for benzodiazepine pharmacology. Nature 338:582–585. (1996) Long-lasting reduction of inhibitory function and gamma-aminobutyric acid type A receptor subunit mRNA expression in a model of temporal lobe epilepsy. Proc Natl Acad Sci USA 93:9665–9669. (1999) Sr2+-dependent asynchronous evoked transmission at rat striatal inhibitory synapses in vitro. J Physiol (Lond) 514:447–458. (2000) Colocalization of multiple GABAA receptor subtypes with gephyrin at postsynaptic sites. J Comp Neurol 420:481–498. (1994) Assembly of GABAA receptor subunits: role of the δ subunit. J Neurosci 14:7077–7086. (1997) GABAA receptor subunits in the rat hippocampus II: altered distribution in kainic acid-induced temporal lobe epilepsy. Neuroscience 80:1001–1017. (2004) Tonically active GABAA receptors: modulating gain and maintaining the tone. Trends Neurosci 27:262–269. (2005) Changes in mIPSCs and sIPSCs after kainate treatment: evidence for loss of inhibitory input to dentate granule cells and possible compensatory responses. J Neurophysiol 94:952–960. (1995) Tonic inhibition originates from synapses close to the soma. Neuron 14:1273–1283. (1996) The γ2 subunit of the GABAA receptor is concentrated in synaptic junctions containing the α1 and β2/3 subunits in hippocampus, cerebellum and globus pallidus. Neuropharmacology 35:1425–1444. (1997) GABAA receptor subunits in the rat hippocampus I: immunocytochemical distribution of 13 subunits. Neuroscience 80:987–1000. (1999) Preferential coassembly of α4 and δ subunits of the γ-aminobutyric acidA receptor in rat thalamus. Mol Pharmacol 56:110–115. (2004) Distribution of α1, α4, γ2, and δ subunits of GABAA receptors in hippocampal granule cells. Brain Res 1029:207–216. (1997) Stoichiometry and assembly of a recombinant GABAA receptor subtype. J Neurosci 17:2728–2737. (2001) Targeted disruption of the GABAA δ subunit gene leads to an up-regulation of γ2 subunit-containing receptors in cerebellar granule cells. J Biol Chem 276:10532–10538. (1997) GABAA receptor subunits in the rat hippocampus III: altered messenger RNA expression in kainic acid-induced epilepsy. Neuroscience 80:1019–1032. (1991) Cloning, pharmacological characteristics and expression pattern of the rat GABAA receptor α4 subunit. FEBS Lett 289:227–230. (2003) Synaptic changes of the gamma-2 subunit of the GABAA receptors in a mouse model of temporal lobe epilepsy: an ultrastructural study. Soc Neurosci Abstr 29:568–12.